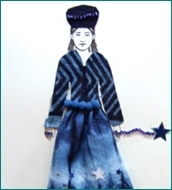 Trafficked girls and girls at risk created original, fashion note cards inspired by Cambodia’s renowned textile traditions. 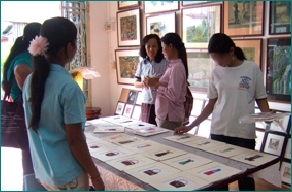 The girls exhibited and sold their note cards at the New Gallery, a Cambodian owned gallery in Phnom Penh, Cambodia. The program helps girls regain their self-esteem and develop their talents through art. Girls at the Santa Margarita Detention Center in Lima, Peru created art inspired by Peruvian textiles and contemporary fashion design. The classes offered creative opportunities for girls, ages 14-18 years old, who have been sentenced to Santa Margarita by the court for felony convictions. 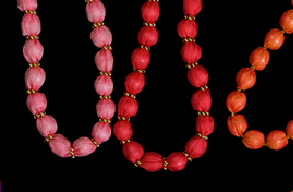 Village girls at risk and girls living at a safe house shelter in Phnom Penh participated in an educational design training program and learned how to create silk-wrapped jewelry for income generation.